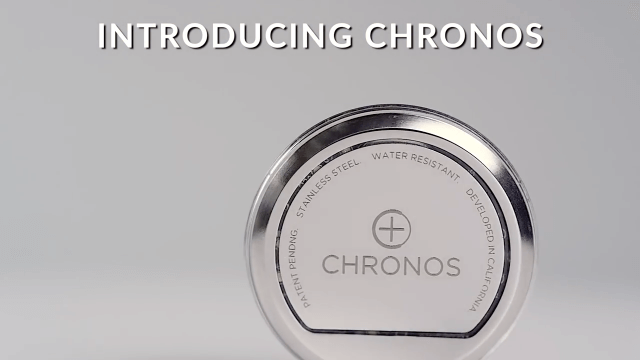 Chronos Wearables | Your Watch. Smarter. Will you expand on payment options? Paypal? We are currently expanding on our available payment options. Chronos will also be available at major US retailers later this year. Please stay tuned, and look for updates via our curated Newsletters. The Chronos team is currently expanding on its availability, worldwide. Please stay tuned for updates, both on our social media pages, as well as through our curated newsletters. What comes with Chronos when I purchase? How do I setup Chronos? Simple! Open the package and remove the Chronos disc, the Quick Start Guide, the cleaning cloth, and the including USB charging dock. Refer to the Quick Start Guide to attach Chronos to your watch and to sync Chronos to your phone. ● Wipe the back of the watch you want to pair Chronos with with the including wet wipes. ● Plug in the included USB charging dock to a USB charger or laptop. ● Place your watch, with Chronos attached, onto the charging dock. Be sure to fully charge Chronos for 30 minutes before continuing. ● Download the Chronos app on the App Store and follow the steps found on the Quick Start Guide. The guide will help you connect Chronos to your phone. ● After Chronos has synced to your device, open the accompanying Chronos app and select your preferences. *When attaching Chronos to your watch, make sure to remove the protective plastic layer from the microsuction surface. After Chronos has been fully charged, download the Chronos app on the App Store. Open the application, and our Quick Start Guide will prompt. After you are finished with the mentioned steps, Chronos will automatically connect to your phone. Can I connect Chronos to multiple phones? You can easily connect your Chronos from phone to phone. Simply disconnect your current phone from Chronos via your Bluetooth settings. Place Chronos on charger and make sure your second phone has Bluetooth on before resyncing to the other phone. 1. Uninstall the Chronos app. 2. Toggle your bluetooth ON/OFF. 3. Reinstall the app, and follow the Quick Start Guide. 2. Choose the app you’d like Chronos to notify you of (Gmail, Messages, Phone, etc). a. Choose from the 7 LED notifications you’d like to assign the app to. Take note, you may also choose NO LED at the righthand side. b. Choose the vibration pattern you’d like to pair the LED light to. You could also create custom notifications for your favorite contacts. To do so, simply choose “Chronos Contact” in the submenu after tapping Add Notification, find the contact you’d like to add notifications for, and continue to Step 3. To delete any app notification, swipe the app towards the left, and tap “Delete”. To temporarily disable LEDs (theatres, important meeting), tap the Menu button on the top left corner, and choose “OFF” for Brightness. You can also choose a lower brightness level. What apps work with Chronos? Chronos works with all of your essential apps, like Phone, Messages, Email, and Calendar. It can also alert you of notifications from apps such as Gmail, Facebook, Instagram, Twitter, LinkedIn, Google+, Whatsapp, Slack, Uber, and so much more. The list of compatible apps is expanding, and updates will be sent to your device through software upgrades. Feel free to suggest any apps you’d like represented, either via email (info@chronoswearables.com) or directly from our accompanying Chronos app, tapping “Make your app work with Chronos” at the bottom of the Add App list. Does Chronos support [mentioned app]? Although we currently do not offer that function, it could easily be added in future app updates. We’ll be sure to keep this into consideration. Notifications aren’t working for this particular app. Why? Make sure that Notification Center is enabled for the app in question. What fitness apps sync up to Chronos? Chronos collects and supplies fitness data to the iOS Health app. The data is then curated to various other iOS fitness apps that also collects data from the iOS Health app. Although, we’d recommend using the Chronos and iOS Health apps as your primary sources of fitness tracking, as they work best together. Other fitness apps will be compatible with Chronos later this year. for best accuracy, allow Chronos to be the primary source for fitness data. To do so, open the iOS Health app. From there, tap Activity, then Steps. Choose Data Sources & Access, then tap Edit on the top right. Drag Chronos to the top of Data Sources. Health app will now use Chronos as its primary source of fitness data. This will alleviate any issues with double counting (You can repeat the same procedure for Active Energy and Walking + Running Distance). Will Chronos notify me if I have a missed call or voice message? Chronos currently notifies you of incoming messages and calls. We may offer custom notifications to notify you of missed calls / messages via future software updates. Can I answer calls with Chronos? Chronos allows you to silence incoming calls. We may add this feature in future software updates. When will Android be available for download? We hope to have our Chronos Android app available in late October - early November. Our team is continuing to develop it, making sure it is of the same quality as its iOS counterpart. We’ll be sure to update you as we progress. Will there be open development for the Android app? We may offer open source development for Android users in the near future. 1. Tap on the “Gestures” tab on the bottom right corner. 2. Toggle on/off the gestures you’d like to enable for your watch! A checkmark indicates that the specific gesture is active. a. Silence Calls (“Incoming Calls” tab): When a call is incoming, and you’d like to silence it, simply double tap the face of your watch. b. Control Your Camera Remotely: open your camera app. Then, double tap the face of your watch to control the camera’s shutter. c. Media Playback: open your media app (Spotify, iTunes, Google Play Music, etc). Double tap the right side (crown) of your watch to play and pause music. Triple tap to skip a track! d. Find Your Phone: repeatedly tap the face of your watch, and your phone will send out a distress call to help you find it. e. “Check the Time”: Within 5 seconds of receiving a notification, lift your wrist as though you are checking the time, and Chronos’ notification will repeat itself. Can I customize the gestures to do another action? The gesture controls that Chronos offers are currently preset. We may offer custom actions in the near future. Can I control the volume with Chronos? Chronos gesture controls allows you to play/pause your music and skip tracks. Volume control may be added in the near future. Will my Chronos be upgradable? Will there be new features? Chronos will be regularly updated to added more features and functionality. The updates will automatically sync to your Chronos via the App Store. 1. Tap the “Fitness” menu on the bottom left corner (Chronos will automatically sync to your Health Kit). 2. Here you will see your current fitness data, starting with your steps. Swipe the screen left and right to switch between steps, distance, and active calories. 3. To customize your goals: tap “Manage”. Swipe or tap the arrows to change your daily targets for steps, distances, and active calories. 4. Reading your progress. Blue markers will indicate (by the hour) when you were actively moving towards your goals, and the varying sizes of the markers indicate how vigorous your movements and workouts were. 5. To check out your past days, swipe the Day label to the right or tap on the specified arrows. 6. Share your workouts on Social Media! When in the Fitness tab, tap on the Share button on the top right corner, and choose the social media channel you’d like to share your progress to. Chronos will screen capture your workout for the day and share it with the world. Does Chronos offer sleep tracking? Chronos counts your steps, measures distances travelled, and logs active calories burned. We may offer sleep tracking through future software updates or future iterations of Chronos. Chronos counts your steps, measures distances travelled, and logs active calories burned. We may offer a heart rate monitor in a future iteration of Chronos but this version does not have it and it is not something we can add through firmware updates. Will Chronos tracking my fitness while disconnected to the phone? Chronos will track your steps while disconnected to your phone. When you reconnect Chronos to your device, it will sync all of the collected information and log it into your Chronos app. Can I swim with Chronos? Chronos is IP67 certified, water and dust resistant. We do not recommend swimming with Chronos, as the microsuction bond becomes weaker when wet, and Chronos may fall off the timepiece. What are the Chronos warranty and return policies? Download Chronos warranty and return information here. How strong is the microsuction on Chronos? The Microsuction will easily attach to the back casing of your watch. It takes considerable amount of effort to detach it, guaranteeing that it will stay fastened. Strength may also depend on the material and type of surface that it attaches to. Engravings may provide a slightly weaker bond. Can I charge Chronos overnight? It is safe and recommended to charge Chronos overnight. This way, Chronos will always be charged and ready to go. How can I tell when Chronos is fully charged? When Chronos is on its charger, tap it to get the charging status. If it glows red, it is in the process of charging. If it glows green, it is fully charged. Currently out of stock at wearchronos.com. Please go to macys to order now. ©2017 Chronos Wearables. All rights reserved.